Taking a giant bite of that juicy, grilled burger with melted and drippy cheese and all those crisp toppings is the ultimate Memorable Meat Moment. If you’ve never made grilled cheeseburgers yourself, you will be blown away by how it will absolutely crush all your past wimpy cheeseburger experiences. You won’t have to hunt for the meat in your bun this time. The burgers are a statement piece in this meal. I love how each bite has that charred grill flavor. The meat is loaded with flavor and is SO JUICY. It may be extremely controversial and in some cases blasphemous to add anything to the hamburger meat, but I don’t mind going against the mainstream to get a juicy and flavorful burger. The perfect burger with cheese may already deserve a standing ovation, but with the addition of the burger sauce that has just just the right amount of tang and sweetness and all your favorite toppings, it just goes over the top. We only make burgers a few times a year, but when we do, we aren’t shy about it and go all out. In a medium bowl, pour the milk over the breadcrumbs, until the breadcrumbs are completely covered in milk. Grate the onion into this same bowl, add the minced garlic clove, Worcestershire sauce, tomato paste (or ketchup), the salt and pepper. Mix to combine. A seasoned and moistened breadcrumb mixture is called a panade. This will prevent the burgers from being dry and flat. By using a panade, it will help keep the moisture inside the meat as it cooks. 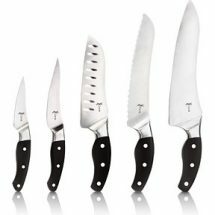 Many recipes will not use a panade and that is just fine if you are using really good quality meat with a high fat content that you ground yourself. You still have to be careful not to overcook the meat. Using a panade will keep the meat juicy even if it’s cooked all the way through. By adding onion, garlic, Worcestershire sauce and tomato paste, we are also adding a lot of flavor into the meat. Add this mixture to the ground beef. Mix to combine, being careful not to overwork the beef. Mixing all the ingredients together first helps to keep the mixing to a minimum. The longer you mix the meat, the more dense it will be. 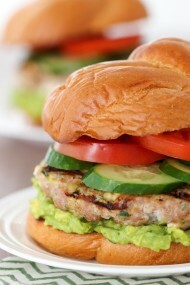 Divide the meat into 4 – 6 even portions, and shape each into a burger patty. 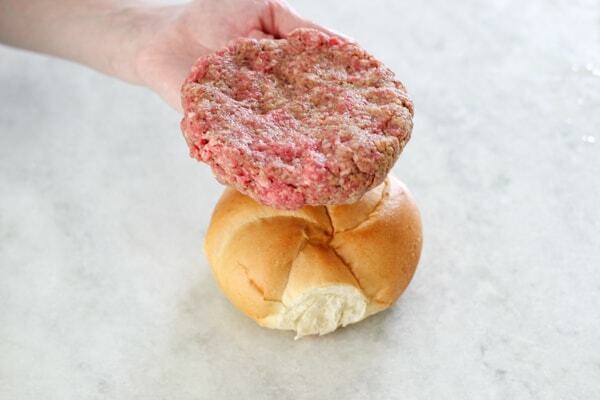 If you use Kaiser rolls or hamburger buns made in a bakery, you will have 4 burgers. If you use the smaller hamburger buns from the bread aisle, you will have 6 burgers. Use your hamburger bun as a guide to how big to make your patties. Your raw burger should be slightly bigger than the bun. Since the meat will shrink a bit when you grill it, it will be the perfect size for your bun if you make it just a tad bigger. Otherwise, you will have several disappointing bites of your burger bun and toppings before you finally hit meat. Make a slight indentation in the center of the patties. As the burger cooks, the center will puff up a little. The indentation in the center will make it nice and even all the way across. I line a rimmed baking sheet or a large cutting board with aluminum foil or parchment paper and place the burgers on top, so it will be easy to carry to the grill. If you are making burgers for a crowd, you can place the burger patties one on top of another, separating the layers with parchment paper. You can even make the meat mixture or the patties ahead of time, up to a day in advance and they will be ready to be slapped on the grill whenever your guest arrive. I’ve even frozen extra patties. Just thaw them and they are ready to go on the grill. Heat your grill on high heat for at least 15 minutes. 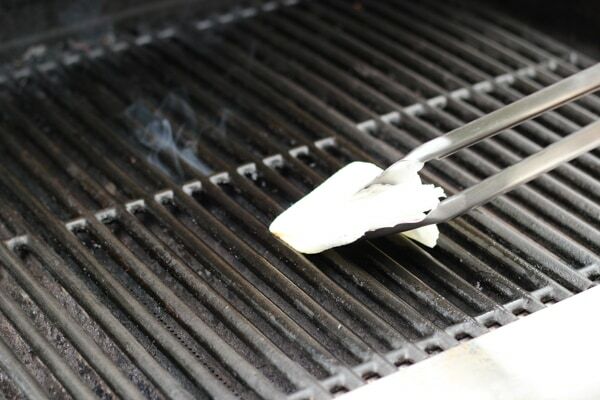 Dip a wad of paper towels in oil, and go over the grill grates with the oil 3-5 times. 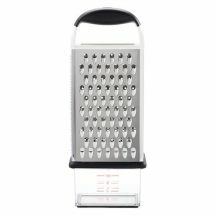 This really helps to make the grates somewhat nonstick and cleans them at the same time. 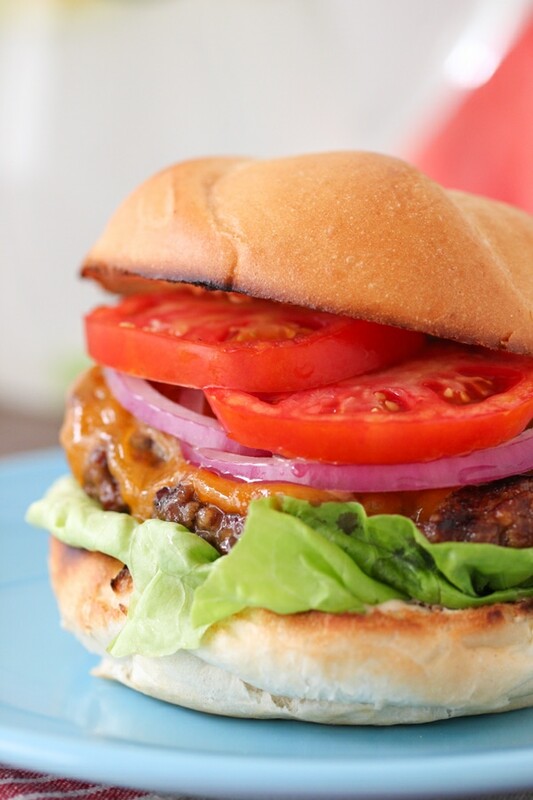 While you are waiting for the grill to preheat, prep all your toppings and make the burger sauce. A burger sauce is basically a combination of mayonnaise and ketchup with some added sweetness, tanginess and flavor. Make the Burger sauce by combing all the ingredients in a small bowl. Refrigerate. You can make the Burger Sauce up to a day in advance as well. 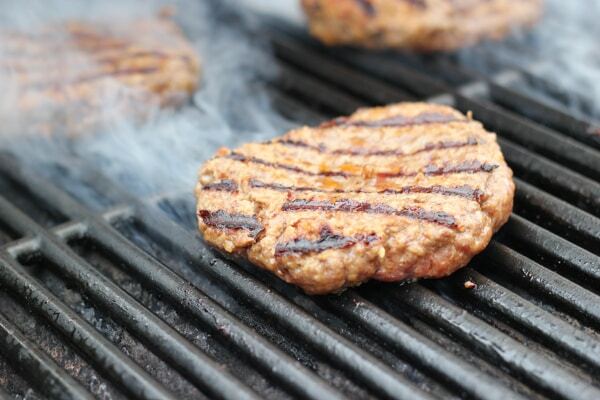 Place the burgers on the preheated grill and grill the burgers about 4 minutes per side. Don’t fiddle with the burgers and most definitely DO NOT press on the burger with your spatula. You will press all the juiciness out of the meat and your burgers will be very dry. 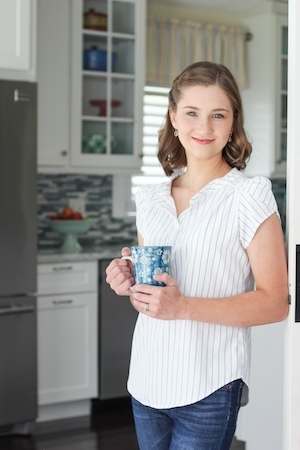 Just set your timer to 4 minutes, step to the side and after 4 minutes give them a flip. You should see beautiful grill marks. Grill the burgers for another 4 minutes. 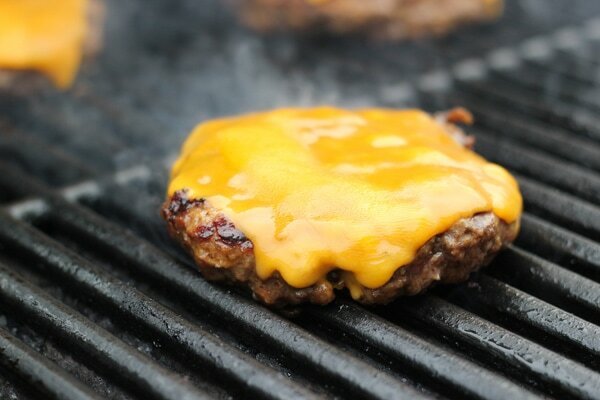 Place a slice of cheese on top of the burgers and grill for 1-2 minutes, just until the cheese melts. If your burgers are smaller and you are making 6 instead of 4, place the cheese on the burger after 2 minutes of grilling on the second side. 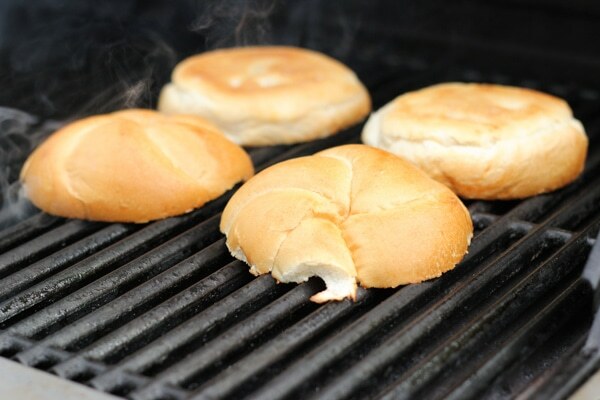 Place your hamburger buns on the grill for a minute or so, just until they get slightly golden. Spread the Burger Sauce on your hamburger buns and load them up with the burgers and all your favorite toppings. If you have leftover grilled burgers, you can reheat them the next day. Pour in just enough water to cover the bottom of a nonstick skillet. Place the grilled burgers into the skillet and cover with a lid. Cook on low heat until heated through all the way, flipping the burgers halfway through. The burgers will stay nice and juicy if you are using this method. Make the burgers first. 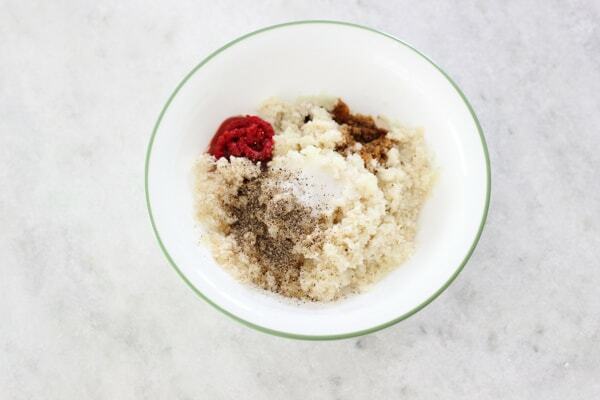 In a medium bowl, pour the milk over the breadcrumbs, until the breadcrumbs are completely covered in milk. Grate the onion into this same bowl, add the minced garlic clove, Worcestershire sauce, tomato paste (or ketchup), the salt and pepper. Mix to combine. Add this mixture to the ground beef. Mix to combine, being careful not to overwork the beef. Divide the meat into 4-6 even portions, and shape each into a burger patty. 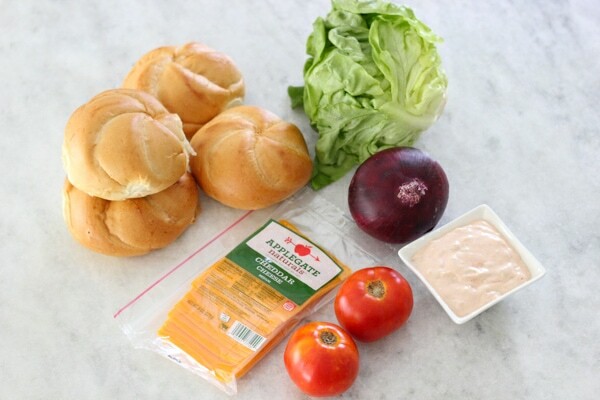 If you use Kaiser rolls or hamburger buns made in a bakery, you will have 4 burgers. If you use the smaller hamburger buns from the bread aisle, you will have 6 burgers. Use your hamburger bun as a guide to how big to make your patties. Your raw burger should be slightly bigger than the bun. I line a rimmed baking sheet or a large cutting board with aluminum foil or parchment paper and place the burgers on top, so it will be easy to carry to the grill. Heat your grill on high heat for at least 15 minutes. 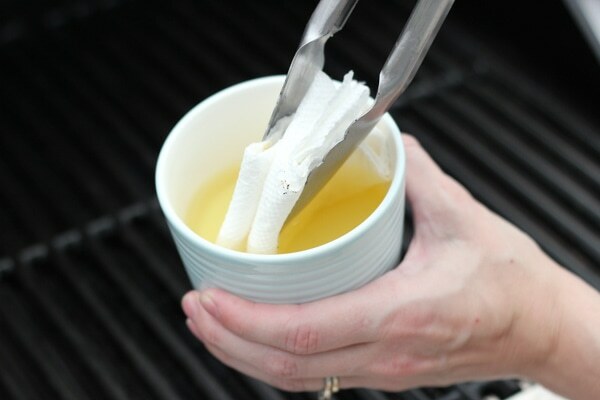 Dip a wad of paper towels in oil, and go over the grill grates with the oil 3-5 times. 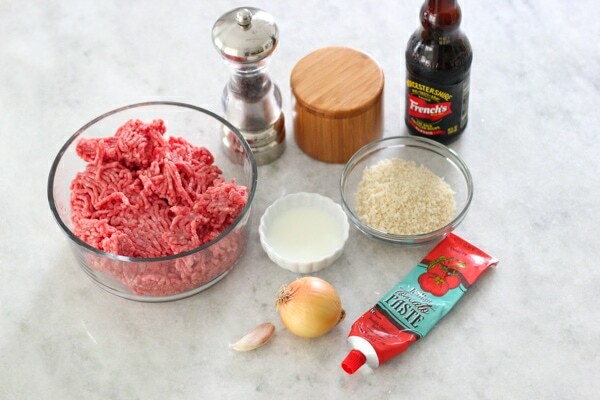 While you are waiting for the grill to preheat, prep all your toppings and make the burger sauce by combing all the ingredients in a small bowl. Refrigerate. You can make the Burger Sauce up to a day in advance as well. 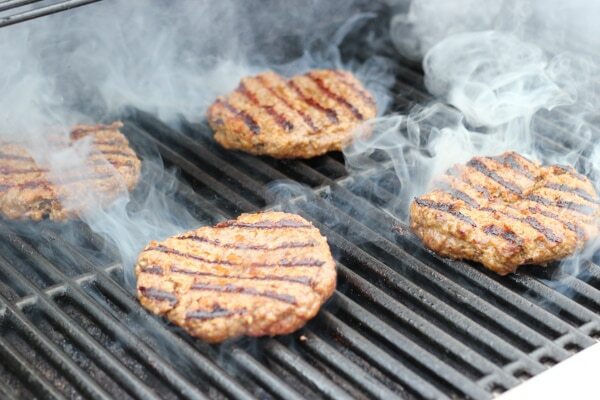 Place the burgers on the preheated grill and grill the burgers about 4 minutes per side. Don't fiddle with the burgers and most definitely DO NOT press on the burger with your spatula. You will press all the juiciness out of the meat and your burgers will be very dry. 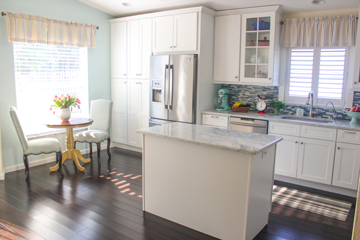 Just set your timer to 4 minutes, step to the side and after 4 minutes give them a flip. You should see beautiful grill marks. Grill the burgers for another 4 minutes. 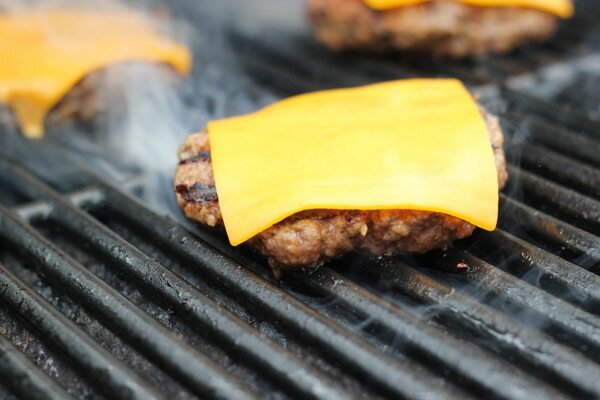 Place a slice of cheese on top of the burgers and grill for 1-2 minutes, just until the cheese melts. If your burgers are smaller and you are making 6 instead of 4, place the cheese on the burger after 2 minutes of grilling on the second side. Spread the Burger Sauce on your hamburger buns and load it up with the burgers and all your favorite toppings. 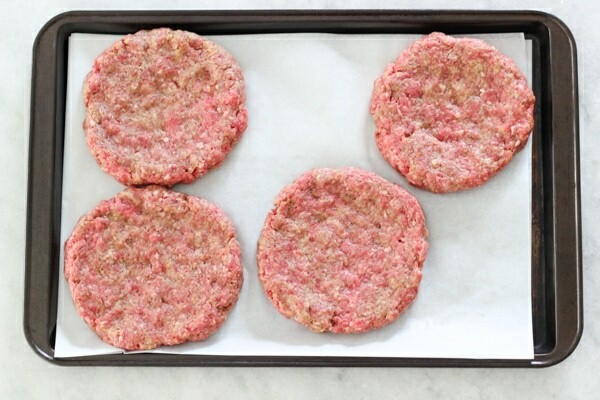 If you are making burgers for a crowd, you can place the raw burger patties one on top of another, separating the layers with parchment paper. 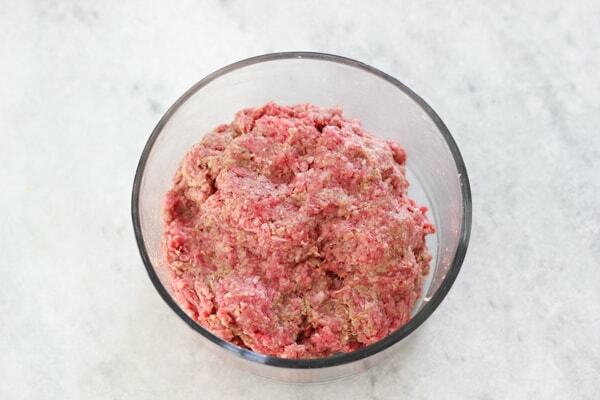 You can even make the meat mixture or the patties ahead of time, up to a day in advance and they will be ready to be slapped on the grill whenever your guest arrive. I've even frozen extra patties. Just thaw them and they are ready to go on the grill. If you have leftover grilled burgers, you can reheat them the next day. Pour in just enough water to cover the bottom of a nonstick skillet. Place the grilled burgers into the skillet and cover with a lid. Cook on low heat until heated through all the way, flipping the burgers over halfway through. The burgers will stay nice and juicy if you are using this method. Oh that burger looks so juicy and delicious! I love your pics of the meat on the grill, makes me want to grab it and eat it all up 🙂 I haven’t made burgers with a panade, but will give it a try because I know that Ukrainian katleti taste delicious and are made with a panade as well. Yep, a good panade is what makes kotleti so juicy and yummy. I hope you like these burgers, Katy. Thanks for the recipe Olga! It looks really yummy! Cant wait to try it! You’re welcome, Liliya. I’d love to hear your feedback once you try it. That burger looks so delicious! I never thought of adding tomato paste and Worcestershire sauce to burger meat! Definitely trying your recipe. I hope you enjoy the burgers, Viktoria:). I love the flavor the tomato paste and Worcestershire give to the meat. I was wondering would u happen to know why hamburgers fall apart while grilling? We always have that problem. It could for several different reasons, Kristina. Do you heat the grill long enough before you out the burgers on the grill? We always preheat the grill for at least 15 minutes before putting any food on it. Also, don’t turn the food over, poke at it, or touch it in any way until you are ready to turn it over. 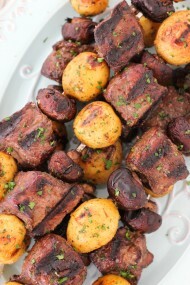 Do you use a binder for the meat like I did in this recipe? Are the patties too loose? You might need to squeeze them a little tighter so they hold their shape. That burger sauce sounds delicious! The sauce is amazing. We never have any left over. Everyone really loads it on once they taste it. 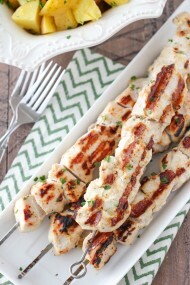 Made these yesterday and they came out very juicy and tender and delicious! 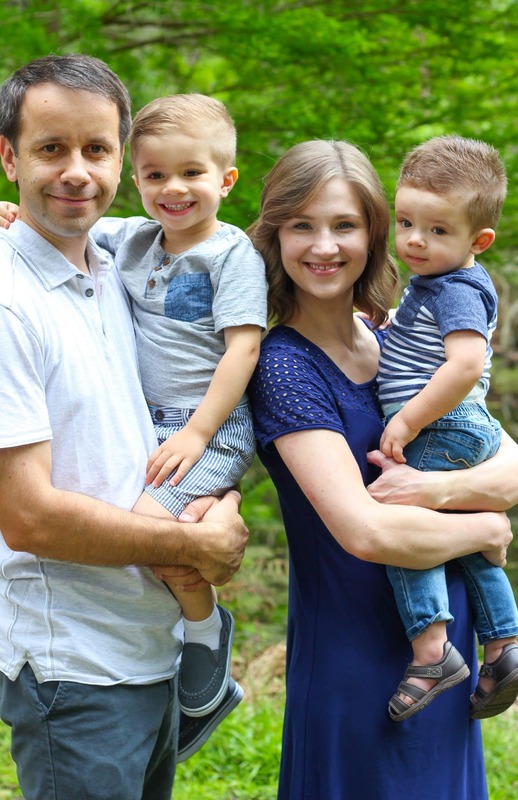 Thank you Olga ! That’s awesome, Tanya. Thank you for taking the time to write and let me know. Can I make these in the oven? If so, how long to bake and what temp? Thank you in advance.